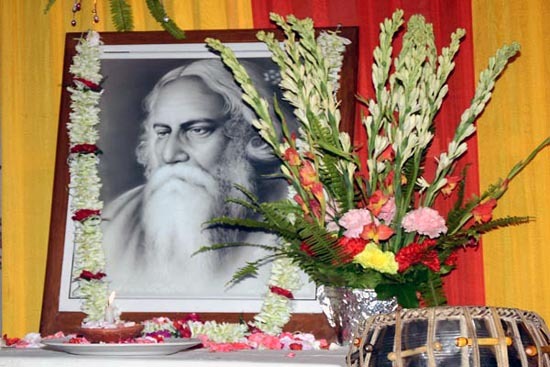 The state Information and Cultural Affairs Department today marked Kazi Nazrul and Rabindra Jayanti at the Nepali Sahitya Sammelan. The programme was slated in May but was deferred due to the state Assembly elections that month. Swami Nityasatyanandaji Maharaj from the Ramakrishna Mission at Roy Villa was the chief guest of the event, while senior deputy magistrate Subroto Chakraborty was the guest of honour. The programme included performances of Rabindra Sangeet and Nazreel Sangeet by Lok Prakash Prakalpa (LPP) artiste Padam Baraily and a group from Mungpoo. Retired professor Om Narayan Gupta, the main speaker at the event, shed light on the various nuances of the writers’ works. Many ex-servicemen, folk artistes and senior citizens were present. Nepali Sahitya Sammelan Darjeeling holds Rabindra Jayanti - The state Information and Cultural Affairs Department today marked Kazi Nazrul and Rabindra Jayanti at the Nepali Sahitya Sammelan.